Usually the harmonic current is proportional to the working current of the harmonic source equipment. Dynamic harmonic filter, which measures load harmonic current by controller, controls bi-directional thyristor zero-crossing trigger, realizes dynamic harmonic filtering and reactive power compensation for non-linear load, and has no impact, inrush and transition during switching process. 1.Automatically tracking the harmonic of compensating change has high controllability and fast responsiveness. Compensation performance is not affected by the frequency fluctuation of power grid, and filtering characteristics are not affected by system impedance, which can eliminate the risk of resonance with system impedance. 2.It can not only control harmonics, but also compensate reactive power, restrain flicker and improve power factor. It can independently compensate for a single harmonic source or centrally compensate for multiple harmonic sources. The specified sub-harmonics are eliminated when harmonics are eliminated, and no energy storage elements are needed when reactive power is compensated. 3.Full-bridge PWM converter is used to generate compensating current, and power devices are operated by the third generation IGBT with high frequency switching mode. IGBT devices and drive and protection circuits are equipped with success rate unit module, which makes the converter small in size, high in efficiency and high in reliability. 4.The current detection technology based on instantaneous reactive power is used to detect harmonic current. The dynamic compensation of harmonic current is realized by multiple instantaneous current tracking control. Because of the current control, the harmonic can be compensated to the maximum extent without overload. 5.TSF+TSC can form a dynamic harmonic and reactive power compensator. 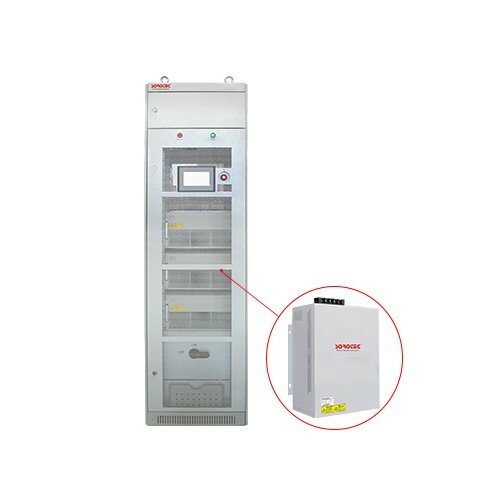 It is suitable for situations with high load harmonic content, low power factor and large load fluctuation. It has dual functions of TSF and TSC, and can effectively realize dynamic harmonic suppression and reactive power compensation. 6.The high-speed detection and operation of DSP ensures the accuracy and effectiveness of harmonic detection and compensation control; it also has intelligent monitoring function, flexible device operation, clear operation parameters and working status, automatic fault diagnosis; and it can expand communication excuse and monitor by PC.